All photo credits go to the National Park Trust. Classrooms on water is a new way of learning for students across the nation. This new type of classroom allows students to learn about science, history, geography, and culture while floating along a river. This past week, Wilderness Inquiry’s Canoemobile program traveled to the nation’s capital giving students in Washington D.C. the chance to experience a unique outdoor field trip on the Potomac River. The National Park Service advocates for “Parks as Classrooms,” and it’s no different when talking about rivers and bodies of water. Canoemobile brings the classroom to the outdoors, engaging youth in environmental stewardship and recreational opportunities. Canoemobile is a collaboration of federal, state, and local partners. OAK members joined Wilderness Inquiry and National Park Trust for a special Canoemobile event in Washington, D.C. with partners The North Face, National Park Service, and the U.S. Forest Service to celebrate the Every Kid in a Park program and kick off OAK’s annual gathering. A highlight in the event was the distribution of Every Kid in a Park passes. This interagency program grants fourth graders nationwide free entry for them and their families to more than 2,000 federally managed lands and waters nationwide for an entire year. The goal of the Every Kid in a Park program is to inspire fourth graders everywhere to visit our federal lands and waters. The program works to ensure “every child” in the U.S. has the opportunity to visit and enjoy their federal lands and waters by the time he or she is 11 years old. Having just been renewed for its third year this past September, the passes given to these students will be valid until August 31, 2018. Seventy fourth graders from D.C. public schools were able to take 24-foot Voyageur canoes along the Potomac river and learn about the watershed. For many of these students, although the Potomac river is just a few miles away, they have never actually been on the river to participate recreationally. With the proper instruction, the fourth graders were able to safely enjoy the Potomac River and learn about its environmental importance. Partnering organizations led activity stations for the students. The North Face led students through a relay race activity which taught students how to properly pack a backpack and build a tent for a camping trip. With a little competition and movement, students were able to stay engaged and learn new skills about recreating in the outdoors. As a wrap up to the morning of events, the fourth graders were asked to fill out postcards from OAK explaining why they love their Every Kid in a Park pass. This initiative is part of a larger national campaign OAK is organizing for any fourth grader in the nation. To download and mail in postcard from home, visit the OAK website. Even WTOP, a local FM radio station, stopped by to cover the event! Read their story. 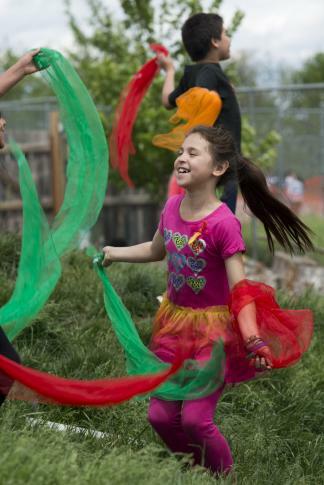 This youth event kicked off this year’s official OAK Week. Later in the afternoon, OAK formally welcomed all member organizations with a Welcome Reception & Member Awards. In the next two days, OAK continued with its Annual Member Meeting, Networking Happy Hour, Advocacy Day on Capitol Hill, and finalized the week with a Congressional Awards Reception. Learn more about the Outdoors Alliance for Kids and ways to joining this national strategic partnership which advocates for equitable and readily available opportunities for children, youth and families to connect with the outdoors. Connecting children with nature has a myriad of benefits that are receiving national attention. Research tells us that children who spend time in nature are more creative, less stressed, better able to concentrate, physically more active … and the list goes on. 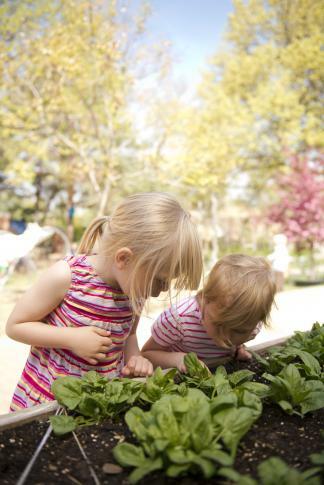 Because of this growing body of evidence, many schools, early childhood centers, and other programs serving children are striving to create and maintain nature-filled outdoor spaces for children. Researching ways to support whole-child learning and the role of learning environments was the original focus of Dimensions Education Research Foundation. As our study pointed to the critical role of nature-filled environments, Dimensions began researching how children learn with nature. Our partnership with the Arbor Day Foundation to create the Nature Explore program was formed and we have spent over a decade working with organizations to bring more nature to children’s daily lives through our workshops, outdoor classroom design process, and natural materials. Over those years of designing and supporting Nature Explore Outdoor Classrooms, we have seen sites with thriving outdoor classrooms and also seen some outdoor classroom sites that were clearly struggling. As a research organization, that prompted us to ask a number of questions: How do you keep people excited about utilizing and maintaining these nature-based learning spaces? How can these spaces be more sustainable? 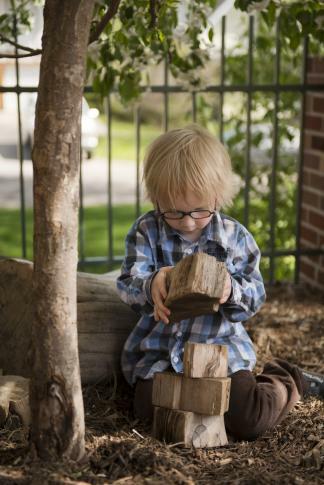 Can we identify characteristics that the thriving outdoor classrooms have in common? Those questions led Dimensions Foundation to conduct a two-year, national outdoor classroom sustainability study. Our researchers purposefully picked a mix of sites from diverse locations representing various types of organizations including schools, early childhood programs, and nature centers. Results of our sustainability study showed the positive impact of Nature Explore Outdoor Classrooms, especially when they weave together the connections between the child, supportive adults, and the environment. Once the research was analyzed, six indicators emerged as key characteristics of thriving, growing, and sustainable outdoor classrooms. Integrate nature and outdoor discovery play into the philosophy, program goals, and mission of the organization. When the outdoor classroom was seen as an integral program component and when that philosophy was shared with educators, staff, parents, and other stakeholders, it became a foundation from which the team could work. Many of the successful sites found the outdoor classroom to be a differentiator that led families to select their program or organization. Successful sites were those that had created a process, from the beginning, for supportive, shared leadership and care of the classroom that was not reliant on just one person. The decision-making process was clearly established … including a system for evaluation and modification of the space, materials, and experiences. Staff and families were also informed and involved. Sites that made staff development a priority and regularly provided training to engage and motivate staff to incorporate nature into their daily programming with children had much more robust outdoor classrooms than those who did not. Staff trainings included shared expectations for safety, ways to document children’s learning outdoors, and ideas and support for rising above challenges. Many successful sites engaged staff by encouraging them to work in groups using individual staff’s unique interests and skills as they related to the outdoor classroom. A number of sites talked about the importance of sharing successes in keeping staff involved and inspired. 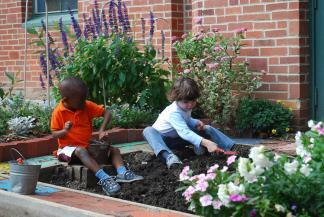 Sustaining the outdoor classroom takes hard work and commitment. Taking time to share stories and celebrate children’s accomplishments, teachers’ insights, and new discoveries emerged as being important for on-going staff engagement. Some sites began building family engagement through simple things such as having parents pick up children in the outdoor classroom at the end of the day so they could see their children engaged in new ways outdoors, hosting school or group events in the outdoor classroom, or starting a family nature club. Keeping families informed about what was currently happening in the outdoor classroom as part of regular program communication was also important in keeping families engaged and involved. Successful sites not only connected with supportive community partners, they also provided orientation for volunteers and found ways to recognize and celebrate their volunteers and partners. These efforts resulted in on-going collaboration and support. Dr. Wayne Dyer writes, “Change the way you look at things and the things you look at change.” The thriving outdoor classrooms reported that they framed the on-going maintenance of the outdoor classroom as an opportunity, not a problem. These sites established regular maintenance schedules and involved children, educators, families, and even community members in caretaking activities on a regular basis when possible. In addition, regular replenishment of frequently used materials, and on-going maintenance considerations were factored into their annual budget. Effective, thoughtful design of the outdoor classroom was also a critical part of caretaking. Good design, incorporating durable materials and low-maintenance native plants, has a big impact on the amount of maintenance the space will require from the very start. Keeping your outdoor classroom growing does take intentionality and effort but the rewards for your whole program are significant. 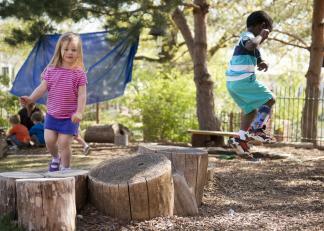 Moreover, the experiences young children have in these spaces can transform their lives. More in-depth information from the sustainability study, as well as real-world examples from our Certified Nature Explore Outdoor Classrooms, can be found in the book, Keeping it Growing – Sustaining Your Outdoor Classroom (Dimensions Educational Research Foundation, 2012). Susan Wirth has close to thirty years in the education field working with children and families. Susan currently serves as Outreach Director with Dimensions Educational Research Foundationand the Arbor Day Foundation. Her work focuses on the collaborative Nature Explore program to help reconnect young children with the natural world. She has authored articles in NAEYC’s Young Children magazine and Head Start’s Children and Families magazine. She has presented at the National Association for the Education of Young Children national annual conferences and Professional Development Institutes, been a keynote presenter for National Science Teachers Association (CESI/NSTA) and many state AEYC groups, and also has spoken at Association for Supervision and Curriculum Development (ASCD), North American Association for Enviornmental Education (NAAEE), and National Head Start Conferences. She was part of the NAAEE team that wrote the nationally accepted Early Childhood Environmental Education Programs: Guidelines for Excellence and serves on the Natural Start Alliance Advisory Board. Enter your email address to follow OAK's blog and media alerts, and to receive notifications of new posts directly to your email.